From my support experience, I see that way too often it becomes easier just to configure HTTPS rather than doing extra hops allowing a use of insecure HTTP (even in development and test environments). I realized that when I wrote my old blog post about the provisioning of app catalog I just created it with HTTP URL and not covered all related details, so it seems now is high time to do it. 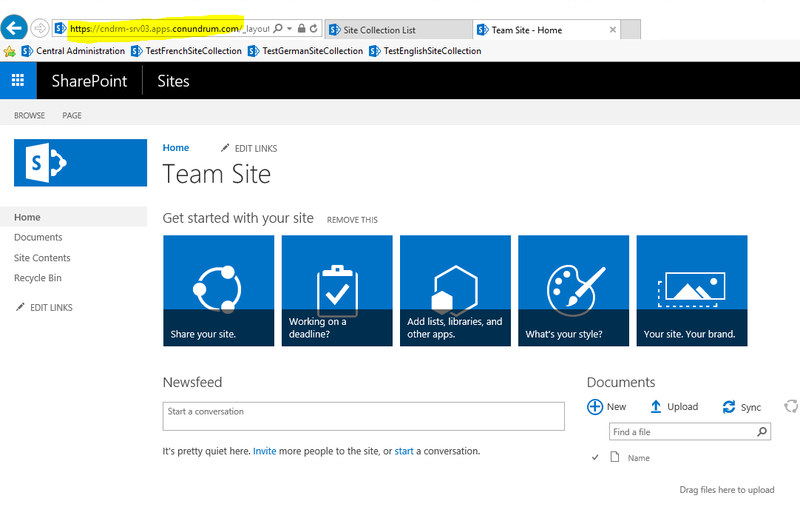 I deleted my initially created HTTP app catalog and decided to start from the very beginning by reviewing SharePoint app model and creating app catalog from scratch with HTTPS URL. SharePoint app model currently includes two types or styles of apps: one for on-prem apps (SharePoint-hosted) and another for cloud apps (provider-hosted), and until June 2014 there used to be a third type – Auto-hosted apps which is no longer supported/available. 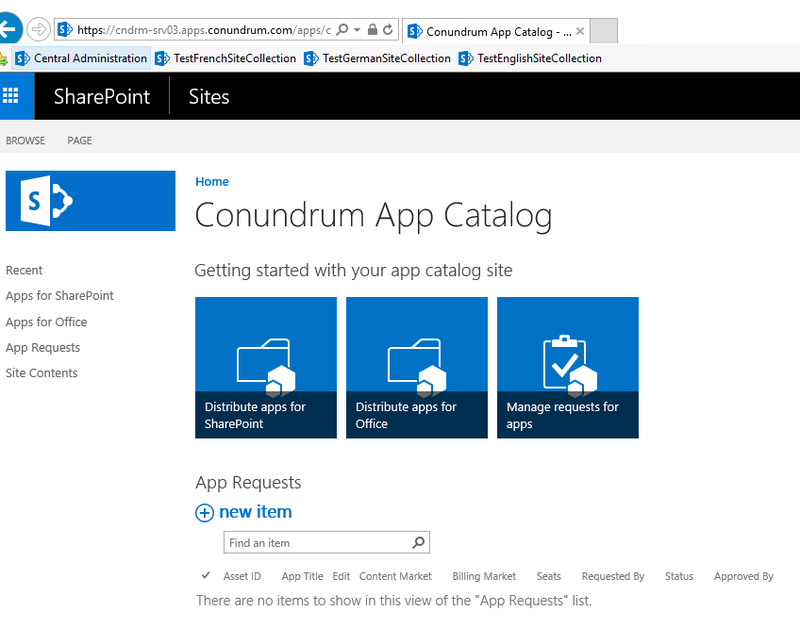 SharePoint-Hosted Apps are installed on SharePoint website (which is called Host Web in this context) and their app resources hosted on an App Web. Normally Host Web and App Web are websites hosted in the same Site Collection. 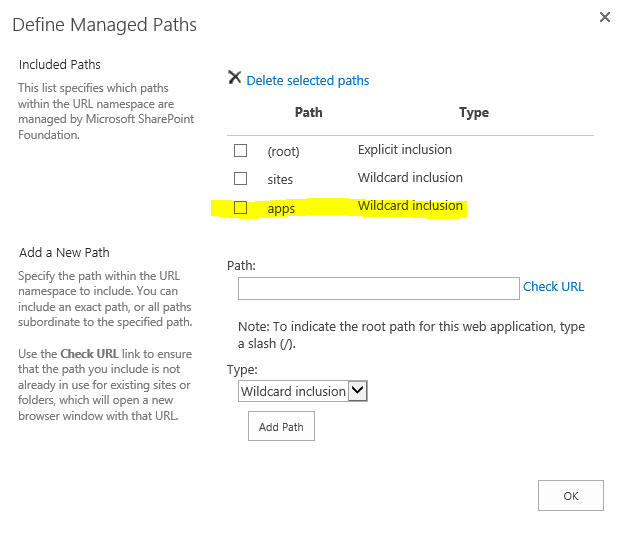 When an app is being provisioned, SharePoint will deploy an app web into a unique domain where all resources associated with a SharePoint-hosted app will be deployed and from where they will be requested. 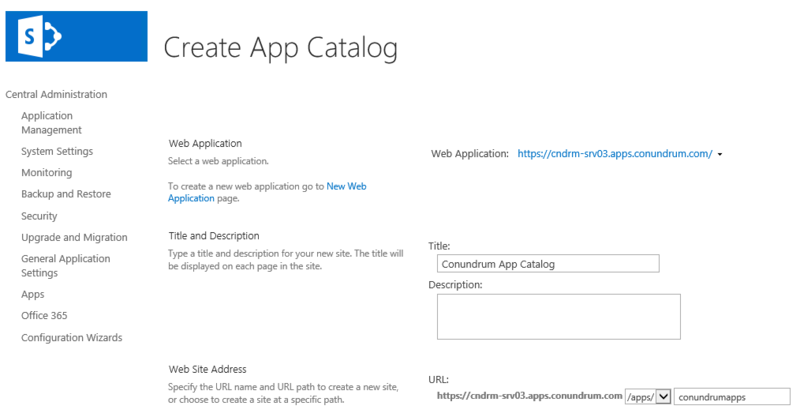 In this model, all app resources deployed into app web (there are no server side components in SharePoint-hosted apps, all components are hosted within SharePoint) and SharePoint creates a unique domain name for each app when it is being provisioned. Provider-Hosted Apps are like SharePoint-hosted apps with that difference that they include server side components, so in this model, some of the app components live outside of SharePoint farm (in the cloud or on a dedicated server). When the provider-hosted app is provisioned it sets up a trust between external components living on the remote host and SharePoint farm. This provides an ability to put your app components on any platform and hardware, host them on Azure or some other remote web platforms. 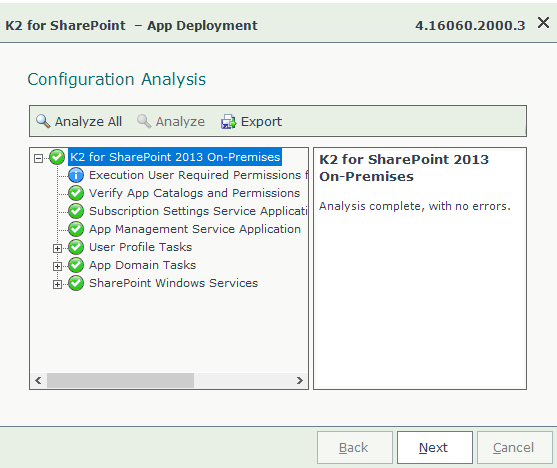 You can also use SharePoint components, resources and services on the remote site (thanks to trust). 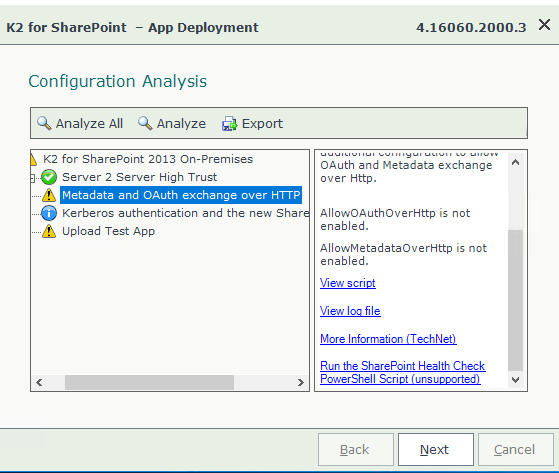 In this model, developers encouraged to use OAuth to communicate across SharePoint components inside the host web and app web, with the ability to by-pass OAuth in on-premise implementations by means of setting up high-trust app which uses server-to-server authentication protocol. Auto-hosted Apps were essentially provider hosted apps hosted in Windows Azure which were available as a preview after SharePoint 2013 release but they are no longer supported (support ended in June 2014). Good list of what was wrong with this model can be found here. 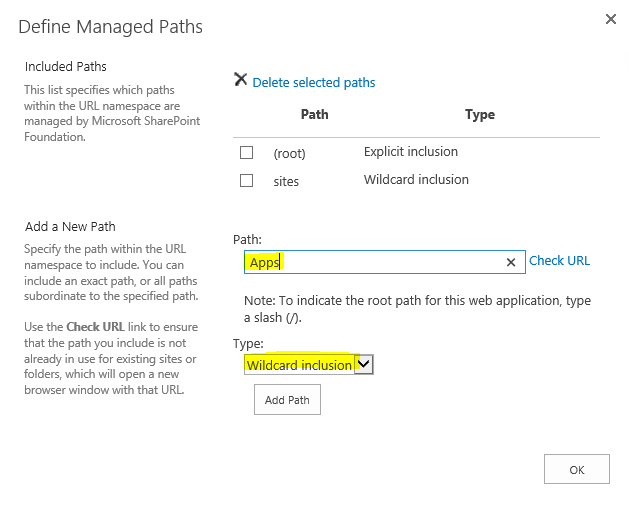 To configure your SharePoint 2016 environment for Apps (SharePoint-Hosted apps) you must create an App Domain, configure an app URL and in addition to this a new DNS zone with an alias (CNAME) will be required too (as you can see there are at least 3 big distinctive steps). First part in this URL – “app” is a configurable app prefix, next goes unique auto generated app ID (1234567abcdefg) which will be different even for the same app per each site collection where you deploy it. 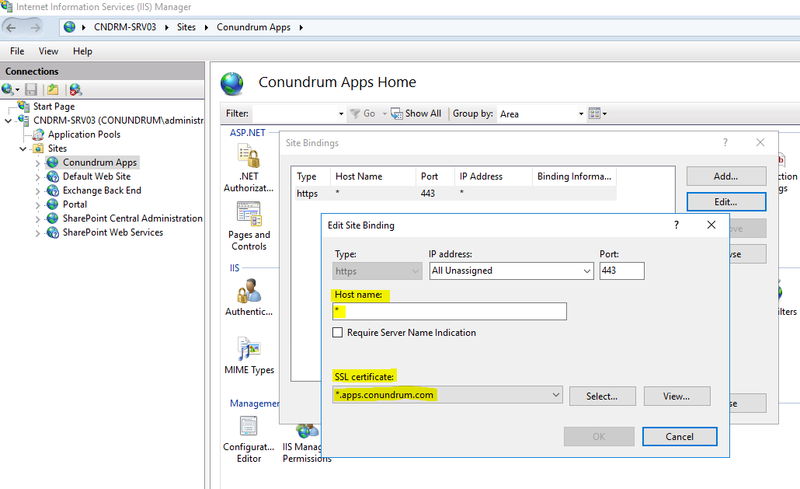 Next goes an app domain part (yourappdomain.com) and after it goes site collection path or the host web (sites/your site) and final part of that URL is an app name. Wildcard DNS entry is required just because we can’t determine random app ID before app has provisioned. Without wildcard DNS entry, new DNS entry for every app will be required and you should go to DNS console and create it manually each and every time. If you need more detailed, step by step instructions for this you can find them in my old blog post. Step 2. Creating web app, root level site collection and provision required service applications. Next thing we need is Service Applications required for our apps infrastructure. We need to provision Subscription Settings Service which establishes subdomains for apps and generates app IDs and App Management Service which handles app permissions and licensing information. But before doing this, we start with the part which was not covered in my old blog post on provisioning app catalog is the creation of Web App for apps using SSL. This part is often poorly covered/omitted in other blogs and this has been something I stuck with for some time trying to make sense of how this should be configured. To make things clear: we going to preserve this existing web app and create a new one for app catalog for two reasons: to demonstrate full process starting from new web app and to demonstrate how to configure for coexistence of two SharePoint web apps (i.e. 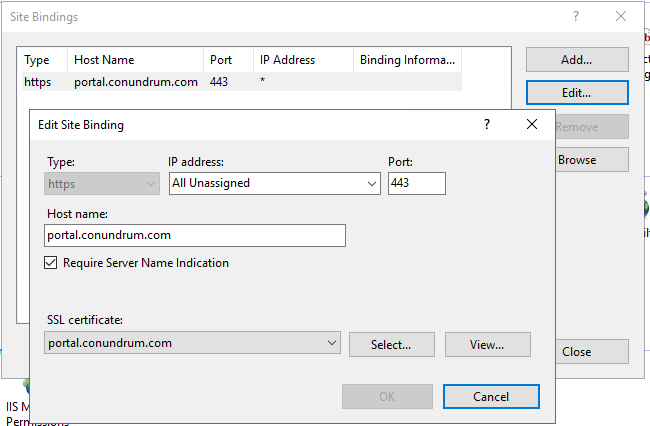 IIS sites) on the same IP address using SNI feature. But remember your app catalog is web app scoped so you create one app catalog per web app and it can be used for all site collections within the web app. 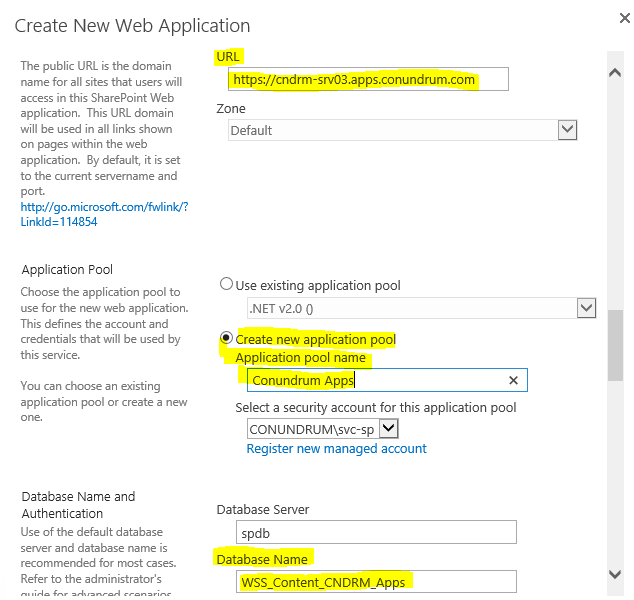 That means that you can skip some of the steps below and configure app catalog for your existing web app. My suggestion is to go through the full process described below and only after this create another app catalog for your existing web app. We then filling in related form giving our Web Application descriptive name (Conundrum Apps in my case) specifying port 443, enabling Use SSL option and leaving Host Header empty (remember – apps have random IDs, therefore we need wildcard DNS entry, wildcard certificate and this is why we can’t use host header). Next step is configuring bindings for our newly created Web App in IIS as well as adding this certificate to Trusted Root Certification Authorities on your SharePoint server (refer to blog post/video I mentioned above for more details). As you can see from the screenshot above we just select our wild card certificate as well as type in the wild card (*) in Host name field. Now, for our new web app and related root site collection to be hosted on the same box as our other SharePoint web app/site collection(s) we must run multiple SSL sites on the same IP. 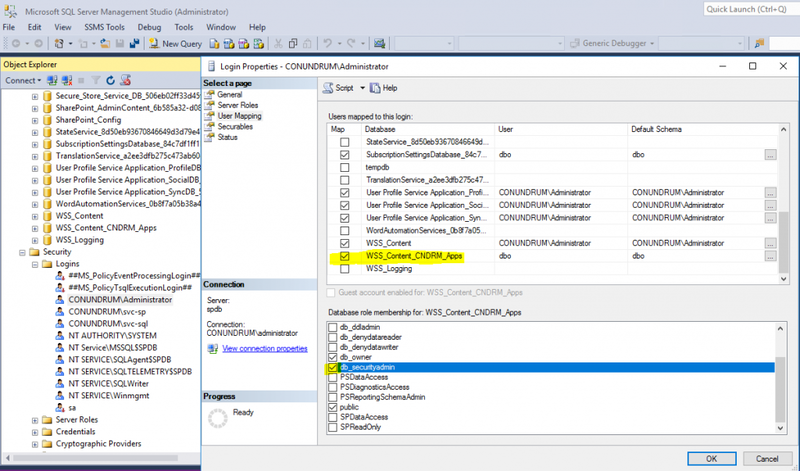 Such configuration was not possible without extra IPs or custom ports prior to Windows Server 2012/IIS 8 where support for SNI (Server Name Indication) extension to TLS protocol was added, allowing the use of hostname to identify the network endpoint. SNI also requires browser side support, but all modern browsers have it. 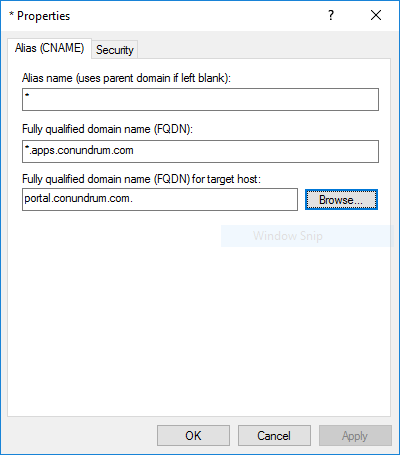 Thanks to this we just add Require SNI + host name to our primary web app, while leaving SNI/host name unspecified for our application catalog web app (which receives all requests which not explicitly indicate configured host header, portal.conundrum.com in my case). 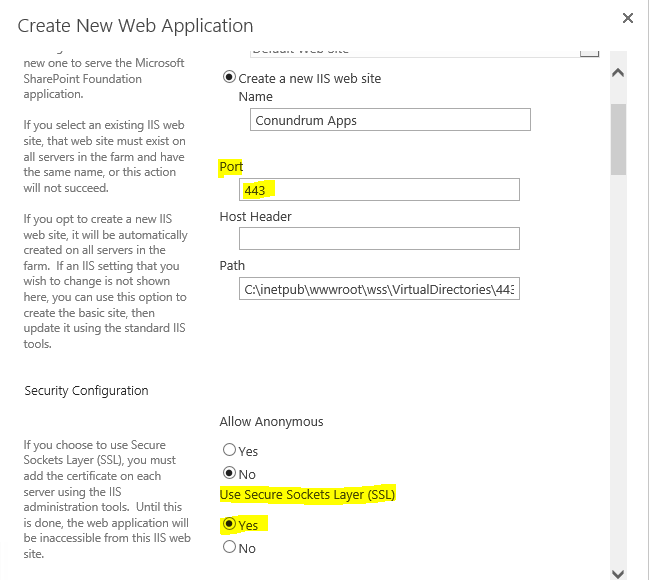 After somewhat lengthy preceding part covered mainly DNS/IIS stuff we moving to configuration related Service Applications in SharePoint. Remember in the very beginning we mentioned Subscription Settings Service which establishes subdomains for apps and generates app IDs and App Management Service which handles app permissions and licensing information? Time to finally configure them. 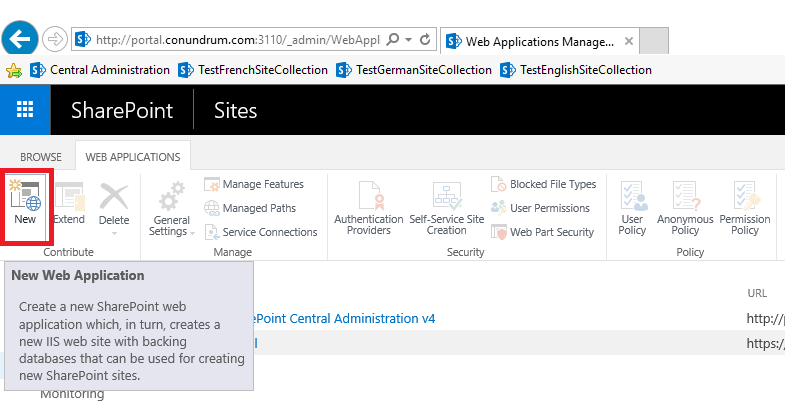 In SharePoint 2013 before running PowerShell scripts you had to start related services on the server, in SharePoint 2016 instead of clicking Start for respective service you should click on Enable Auto Provision link instead (Subscription Settings Service listed as Microsoft SharePoint Foundation Subscription Settings Service, not sure why MSFT keeps this lengthy prefix 🙂 ). In my case Enable Auto Provisioning action was not displayed and Manage Service Application action was presented instead for App Management Service (probably because I haven’t start from scratch and deleted app catalog and related service apps earlier in this environment). In any case, we just specifying app domain we created earlier in DNS (i.e. parent domain under which all our applications will be hosted) and app prefix (static part of our apps URLs, which will be prepended to the subdomain of the app URLs/app GUID). Like I said in the very beginning, having HTTPS configured tend to save you a couple of extra configuration steps. I hope you find that detailed app catalog provisioning walkthrough useful and hope that now I can finally look carefully at some of the new features in SharePoint 2016 and write a blog post about them.